Our Bridal Handcrafted Custom Jewelry are made with Swarovski Champagne Pearls & Lite colorado Crystals Collection & latest style & upcoming designs. 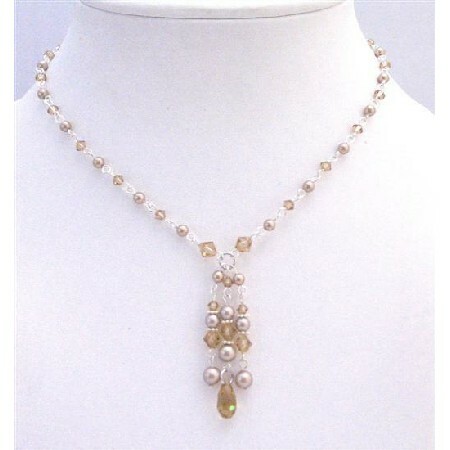 This is very beautiful delicate sleek & elegant 3 strings Drop down of champagne Pearls lite colorado Crystals & very cute teardrop Necklace all made with Swarovski Lite Colorado Crystals & Champagne Pearls. Crystals & Pearls features gorgeous with Swarovski Lite Colorado Crystals & Champagne Pearls.